Looking for a way to contribute to your community? 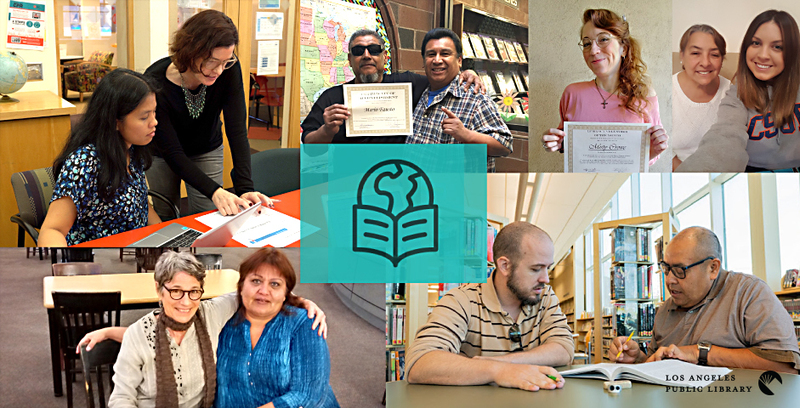 Consider becoming an adult literacy volunteer with the Los Angeles Public Library! Statistics show that an estimated 33% of the adult residents of Los Angeles lack basic prose literacy skills. This means that, at best, they may be “able to locate easily identifiable information in short, commonplace prose text, but nothing more advanced” (National Center for Education Statistics, 2003). Of course, many of these people cannot read at all. Los Angeles Public Library tutor Luisa Latham says of her students: As a result of being illiterate, these individuals have felt isolated and alienated and not able to function fully within their communities…[They] have expressed to me their fear and hesitancy around any experience where they would be asked to read—to fill out a job application, to vote, to do so many things that we take for granted and that they cannot participate in. You can help alleviate literacy inequality by becoming a volunteer. We have many different opportunities, including teaching classes, working one-on-one with a student, and more. Are you ready to have your life changed by becoming an adult literacy volunteer? Contact us today! Call 213-228-7037 or find the Literacy Center closest to you.